Heath, you and a guest will get to partake in a noon wine tasting on the Saturday of your choosing in April. 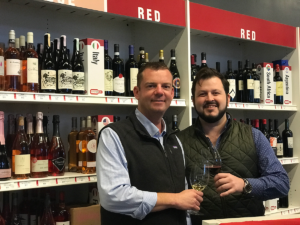 Matt will lead the tasting and it’ll last at least an hour… possibly longer depending on how much you and your guest enjoy the wines and ask great wine-o questions! I look forward to talking and sampling wine with you! The Wine Feed was formed in early 2011 by two friends with a common interest in sharing their travels and wine experiences with others. Offering a friendly, unpretentious shopping experience, the highly trained staff are just as passionate as the owners. Each location offers a full-service modern wine bar, monthly wine clubs, informative classes, private events, and international wine tours. Visit TheWineFeed.com for more details.